I jumped on the Facebook bandwagon as it was pulling out of town and created a Facebook page for RSS4Lib (become a fan!). 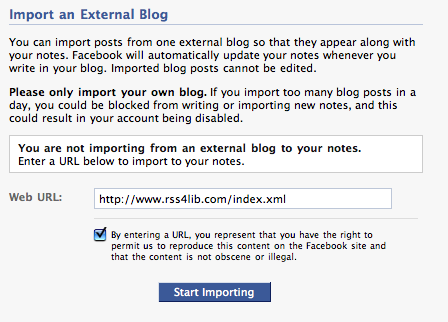 In the process, as I was adding the RSS feed for this blog using the Notes tool, I noticed something more than a little annoying: RSS feeds added to a Facebook page using Facebook’s Notes application are rewritten to drive all traffic from that version of the feed to Facebook, not your own site. While clearly in Facebook’s financial interest to bring more traffic to Facebook, they do so without explicit permission. The feed’s link goes to Facebook (http://www.facebook.com/notes.php?id=81126379633). That page provides reproductions of recent posts. Clicking on a post title, within Facebook, brings up that page in another Facebook page. There is a tiny link at the bottom of the page to “View original post”. They rewrite the link. They change the author from what it is in the original post, “rss4lib@gmail.com (Ken Varnum)”, assign a creator that is not the author cited in the original post, and link to an RSS feed as the source. (Facebook does display the URL of the post, but clicking it goes to the feed. Depending on your web browser, it may not be helpful behavior to get an XML file.) They don’t provide attribution for individual posts on the site. I’m willing to give on point 2 — yes, I understand that by reproducing my blog on Facebook’s site that I’m contributing to their commercial gain — but on point 1, I did not waive my right to appropriate attribution as specified in the license on the blog by agreeing to “reproduce” the blog on their site. If this is “remixing,” allowed in the Attribution Non Commercial license, requires that the licensee “takes reasonable steps to clearly label, demarcate or otherwise identify that changes were made to the original Work.” This has not been done. This sort of misuse of content happens all the time, of course, but rarely so blatantly. I believe that FB’s lawyers would argue that by selecting that check box, you have agreed to grant them a different license that is separate from the CC license. I guess that’s why I’m not a lawyer….